Saturday afternoon saw Paul Porter and Steve Riley line up for the Stadt Moers (sounds much more exciting than Huyton) cross country, with a light drizzle threatening to turn into rain. Another in the Liverpool and District league, and one of the better courses in my opinion. 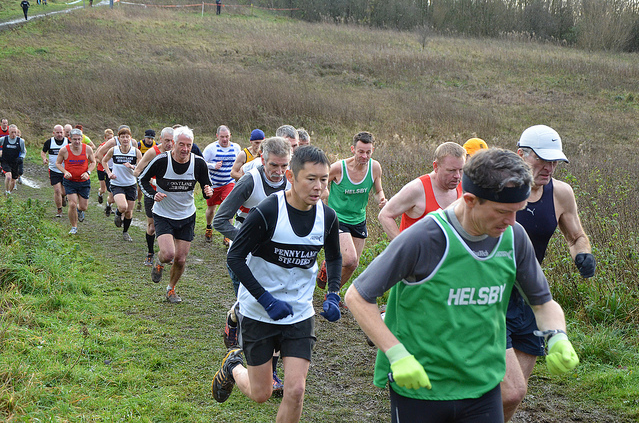 The country park doesn’t look initially promising, but a clever course design and some interesting terrain, makes for a good outing. In the event it stayed dry for the race, but there was still plenty of mud on the ground. We started off with a smaller loop of around 500m to thin out the 140-ish strong crowd, and then moved on to complete 3 laps of the full loop. Around 5.5 miles all in, I’d guess. Paul had a good run in his very first cross country outing and now I think it’s safe to say he’s got the bug. Steve was able to capitalise on the mud by wearing spikes and pushing it a bit more on the corners and descents to just stay ahead of the stronger runner. If you can’t be fast, be cunning! One of the reasons this I like this course is that it’s fairly intricate and loops back in a couple of places, so there’s always something to see — faster runners to chase or slower runners to stay ahead of. Recommended for next time. Thanks to the organisers and thanks again to Dave Pinnington for the pic. See you at the next one!